Sierra Leone's parliament has passed a new law making it a criminal offence to shelter Ebola patients. Those caught face up to two years in prison, the justice minister said. The measure still needs to be approved by the president. 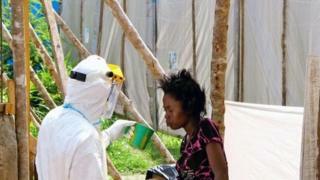 Earlier, Ivory Coast closed its land borders to prevent the spread of the deadly Ebola virus on to its territory. The World Health Organization says the measures - taken by other countries as well - are counterproductive. So far 1,427 people have died - more than in any other Ebola outbreak. The Philippines has ordered 115 troops to return home from peacekeeping operations in Liberia due to the outbreak. Ivory Coast, the largest economy in francophone West Africa, had previously imposed a ban on flights to and from Sierra Leone, Liberia and Guinea. "Faced with new outbreak sites and the reactivation of old sites... the Ivorian government decides to close its land borders with sister republics Guinea and Liberia," it said in a statement on Friday. On Friday, the WHO's Dr Keiji Fukuda expressed concern over so-called "shadow zones", areas which cannot be reached and where patients are not being detected. The organisation confirmed 142 new cases of the disease had been reported since 19 August, as well as 77 deaths. Speaking at a news conference in the Liberian capital Monrovia, Dr Fukuda said combating the disease would take "several months of hard work". "We haven't seen an Ebola outbreak covering towns, rural areas so quickly and over such a wide area," he added. Ebola has no known cure but some affected people have recovered after being given an experimental drug, ZMapp. However, supplies are now exhausted. On Thursday, two US doctors were discharged from hospital after being given the drug, while three Liberian medics are also recovering well.